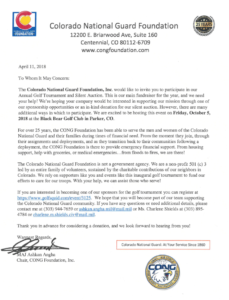 The Colorado National Guard Foundation, Inc. would like to invite you to participate in its Annual Golf Tournament and Silent Auction. This is the non-profit’s main fundraiser for the year, and they need your help! 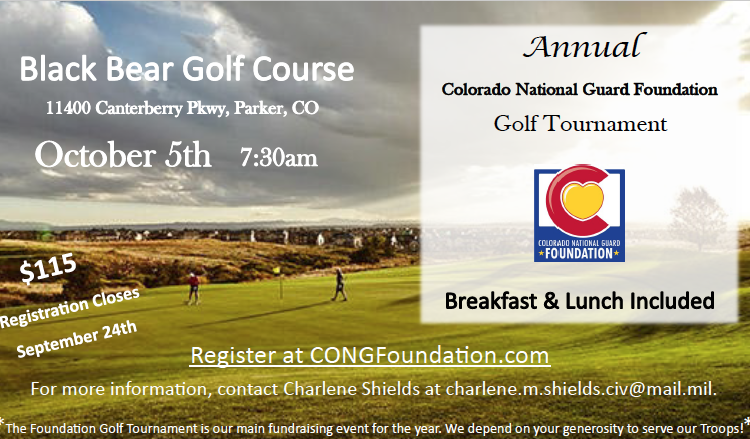 There are many ways to take part of the Inaugural CONG Foundation Golf Tournament. For more information on how YOU can be apart of this fun and exciting event, click here for sponsorship opportunities and golf registration. 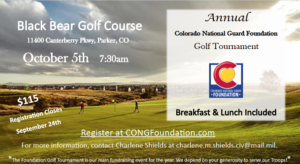 The CONG Foundation is excited to be hosting this event on Friday, October 5, 2018 at the Black Bear Golf Club in Parker, CO. Registration will begin at 7:30am with breakfast being served at 8:00am and a shotgun start at 9:00am. Lunch with be served at noon, following awards and silent auction wrap-up. We hope that you will become a part of our team supporting the Colorado National Guard community. If you have any questions or need additional details, please contact Charlene Shields at 303-895-4784 or charlene.m.shields.civ@mail.mil.